Larysa Zariczniak recalls memories of growing up at the Ukrainian Cultural Centre in Hamilton after she watched it burn down on Saturday. 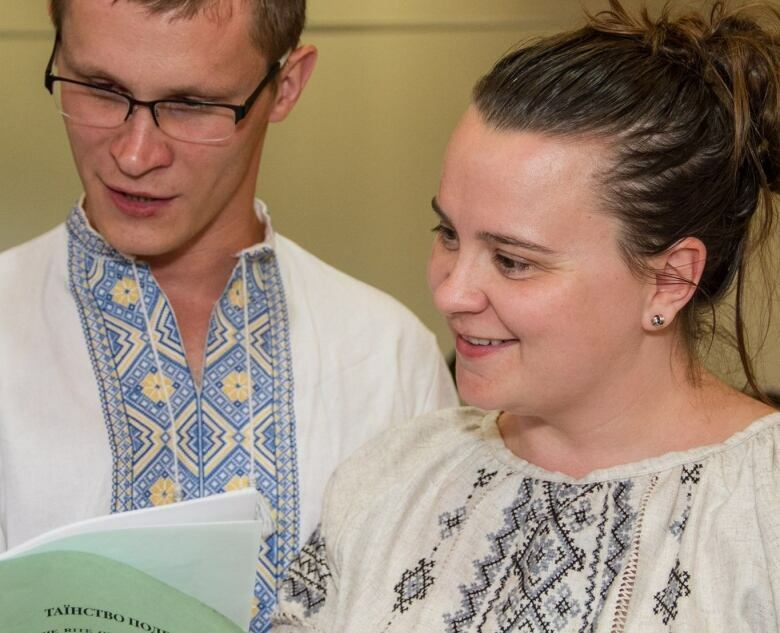 The centre has served the Ukrainian community in Hamilton for decades. 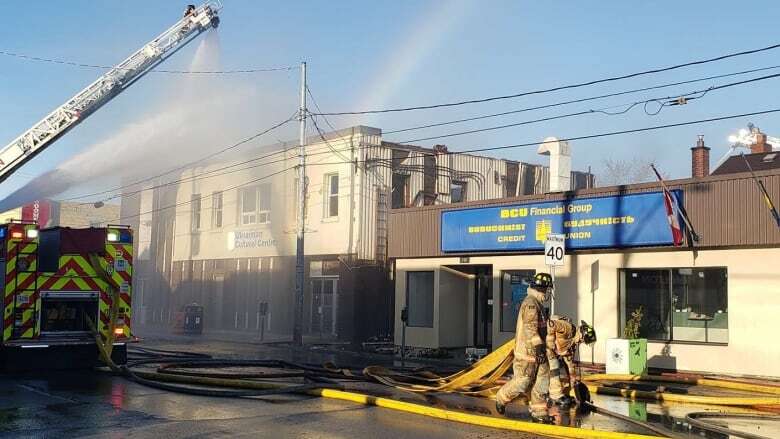 Larysa Zariczniak started going to the Ukrainian Cultural Centre in Hamilton about 30 years ago as a little girl — but she won't be able to return to the building that housed so many of her memories after it was destroyed by a fire Saturday. It was 3 a.m. on Saturday when Zariczniak and her husband, Yura Ivanovo, arrived to the centre located at 241 Kenilworth Avenue North, after being woken up by a phone call. The centre was engulfed in heavy smoke. "I basically just started crying because I spent all my youth there. Basically my entire youth was spent in that building," said Zariczniak, president of the Ukrainian Youth Association. "This building housed us from when we were infants," said Zariczniak. "Friendships were made there." "The building can be considered a total loss," Deputy Fire Chief John Verbeek told CBC News Sunday. He says the Hamilton Fire Department received a call at 12:21 a.m., Saturday for a reported fire at the centre. The first crews to arrive on screen confirmed that there was a fire on the second floor of the building that extended to the roof area, says Verbeek. Verbeek says the situation was immediately upgraded to a multiple alarm, bringing in additional resources from across the city. He says crews simultaneously started fighting the fire while conducting search and rescue. But crews on the inside, who made their way to the second floor had to be pulled out due to conditions and structural concerns. According to Verbeek, the roof and some exterior walls collapsed. There were no injuries, says Verbeek, but damage is extensive and has been estimated at approximately $2 million. Verbeek says the Ontario Fire Marshal has been notified and an investigator went to the scene to determine where and how the fire started. On Sunday, the 36-year-old Zaricnziak told CBC News that the emotional damage is really starting to sink in. "Today I'm little bit more emotional than I was yesterday because I think it's finally hitting me, because that hall was amazing," said Zariczniak, who lives on the Mountain. When asked what memories are associated with the centre, Zariczniak says, "Everything." Zariczniak said it was the place where she learned more about her culture after immigrating to Canada from Poland at the age of six. On Friday nights in high school, she went to the centre to learn about Ukrainian history, literature and geography. She even recalls practising the Bandura, a Ukrainian folk instrument on Tuesdays. Not only was it a place of memories, Zariczniak says the hall itself was beautiful and dates back even further to when it was a movie theatre. Zariczniak says the centre was rented and used by anyone and everyone in the community — you didn't have to be Ukrainian to use the space. "It's just a big impact I think not only to the Ukrainians here, but I think a lot of Hamiltonians." Zariczniak says there are a few other venues in Hamilton where they will be able to hold events.